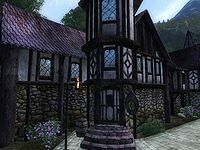 Newlands Lodge is a Dark Elf bar located in Cheydinhal's Market District. It is found adjacent to the West Gate of the city, across the road from the Cheydinhal Bridge Inn and next to Borba's Goods and Stores. The publican, Dervera Romalen, buys potions and food while only selling the latter. The ground floor contains the reception area consisting of an antechamber with a dining room and a second room with the bar and counter. The rooms can be found upstairs. The room that you can rent is spacious but quite bare, containing only a lower-class double bed and chest of drawers. These drawers do not respawn, making them safe for storage. If you feel inclined to pick the Hard lock, right next to yours is a tiny room with a sack and a bed in which you are free to sleep in. The other room, which doesn't have a door, contains an owned single bed. You will find Guilbert Jemane here, usually upstairs in the open bedroom, for the Separated at Birth quest. The whole of the Orum gang, a Skooma-dealing and Camonna Tong-associated gang of Orcs, can be found having dinner here after 8pm. Dervera Romalen is very proud of the Newlands Lodge. She seems especially happy that the Red Queen drinks there. This is possibly related to an unfinished quest intended for Unmarked Cave. "This is a Dark Elf bar. Cursing, spitting, and screaming? No problem. Fighting is fine with me, too, only the Guard objects, and they'll fine you or lock you up. Not my call." However, her high responsibility means she will report any assaults within her lodge. Esta página foi modificada pela última vez à(s) 06h54min de 14 de janeiro de 2013.